The new manager of the Chicago White Sox is...Robin Ventura? Bet you did not think he would be the guy. Hell, he was not even in the list of guys I thought GM Kenny Williams was considering. While Ventura may very much turn into a quality manager, this hiring makes no sense at all. 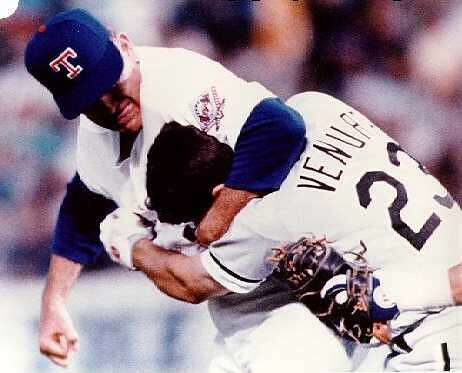 Ventura was a very good third baseman in his 16 year MLB career and he had the reputation for being a strong leader and very intelligent (well, considering the fact he got the crap beaten out of him by Nolan Ryan). But he has no coaching experience (save for some high school work) and of late was working as a special assistant to the White Sox. If Williams and the White Sox brass thought of him as a future manager, why was he not managing in the minors or assisting on Ozzie Guillen's staff? Maybe owner Jerry Reinsdorf did not want to pay for Terry Francona (although he was a perfect fit considering he's worked in the Sox organization and is simply a terrific manager). But if Reinsdorf wanted someone on the cheap, why not hire the prospective favorite for the job in Rays bench coach Dave Martinez, who has seen how to build a competitive club on the cheap under the quirk Joe Maddon and has the makings to be a strong manager. I don't get it to be honest but hey, I've been proven wrong before. Is Brett Favre Right About Aaron Rodgers?